The Empress Ale House. 9912 82nd Ave. 18+ FREE. Charles Demers is a thirty something comedian and the author of three books; George Bowering is eighty, Canada’s first poet laureate, and the author of more than eighty books. Charlie and George are also the best of friends, and the fathers of daughters. In this unique book of correspondence, these two men from different generations write to each other about the burdens, anxieties, and singular joys of parenthood. Fathers know (or don’t know) about raising daughters, as well as themselves and each other. The Dad Dialogues is a passionate, funny, and moving portrait of fatherhood in all its imperfect, beautiful glory. Please join us for a night of stories, beer, and dad jokes. 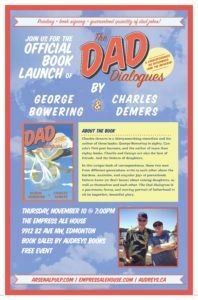 Thanks to The Empress ALe House for the venue, and Audreys Books for bringing in the books! This is a free event. Good news for campus book lovers! H.T. Coutts Library and the Faculty of Education are teaming up again for the Education Book Club, On the Same Page, in Fall 2016. This year’s selection is The Inconvenient Indian: A Curious Account of Native People in North America by acclaimed Canadian author and public intellectual Thomas King. 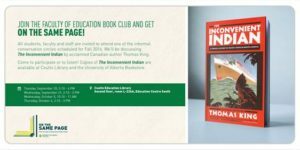 Described as “part humour, part history, part analysis and part personal meditation”, The Inconvenient Indian is a non-fiction extended meditation on Aboriginal identity. Listen to Thomas King discuss the book on CBC Radio. All students, staff and faculty across campus are invited to join one of our informal discussion circles in September or October 2016, whether to participate or to listen. See image for dates/ times/ location. For more online literary resources, click here.